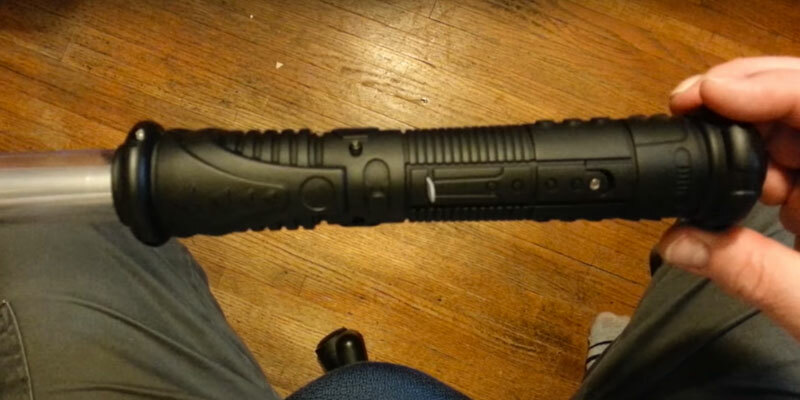 This toy lightsabre looks as awesome as it sounds! A quality rubber handle makes it easy to grip. The 3-colour lights alternate automatically upon every swing or touch. The hilt neither looks nor feels like a realistic weapon. This durable and playable lightsabre was specially designed for the smallest Star Wars enthusiasts. They will set off on an intergalactic adventure as soon as they power it on. Two additional "laser beams" between the blade and the hilt of the sword not only work as a crossguard protecting a warrior's hand but also make the item look fantastic during any battle. Some users would prefer a better packaging. Combining unique shape resembling that of a Kylo Ren lightsabre, the unit will prove to be a triumphant weapon in the hands of your young Jedi warrior. You can choose a static light mode, locking the blade in one colour to act out one of your favourite Star Wars characters, or a colour morphing mode for the most spectacular battles. The handle could be of a better quality. 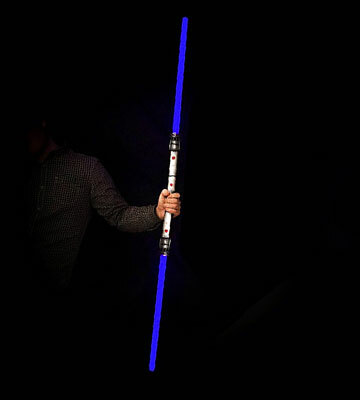 Easy to store away and carry around when retracted, this fantastic telescopic light-up sword will help your Jedi knight get ready for protecting the galaxy. In addition to an outstanding blade design, this fascinating Glowhouse lightsabre has a stylish hilt with a shining crystal on its pommel. The blade might seem a bit short compared to other models. Combining three different colours, this Glowhouse Galaxy sword won't leave your child indifferent. It's also an excellent accessory for any Star Wars cosplayer. 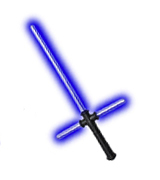 If you buy two Mintoys Star swords, you can join them together with an included connector to get a double-bladed lightsabre. It might be not very convenient to hold because of the buttons on the grip. Both variations of the sword will be highly appreciated by Star Wars fans. It is just what your little Jedi warrior needs to start a never-ending battle for the universe. This lightsabre model stands out from the crowd thanks to several unique properties. First of all, it is worth noting that it glows with three different colours in turn: red, blue, and purple. True fans of the Star Wars Universe will certainly appreciate this feature, as it will give them an opportunity to pick different roles in the battle and cosplay opposing sides of the Force. The red colour is associated with the Sith Order since red crystals powered and gave energy to their lightsabres. At the same time, the blue colour represents the Jedi Order. 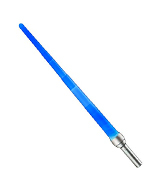 It was the blue energy blade that was employed by the most renowned protagonist of the original trilogy - Luke Skywalker. 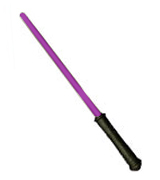 Purple blade light was much less common in the Star Wars films but was clearly visible on screens in the prequel trilogy in the hands of the Master of High Council, Mace Windu. 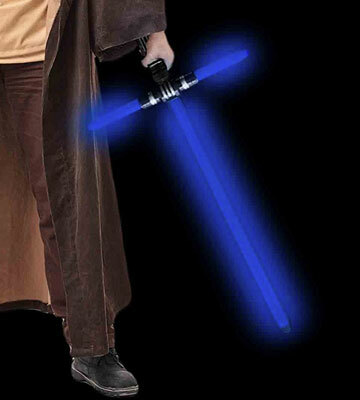 You may change your roles as the blade light changes colour, but with this powerful warrior costume accessory, you may rest assured that the Force will always be with you. With all this colour variety, the lightsabre’s design is surprisingly simple and practical at the same time. It makes only 69 cm in length and weighs 200 grams. That makes it suitable for joyous play by the youngest fans of the fictional saga from 3 years old and up. The solid and durable rubber handle will add to the distinctive look and feel of this toy weapon. The blade cannot be removed and replaced if broken, so we advise being very cautious when wielding this lightsabre and avoid immediate contact with other swords. 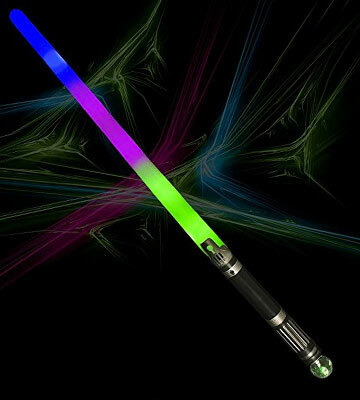 With this incredible and mighty lightsabre, you will be able to protect the whole Galaxy from wars and devastation. 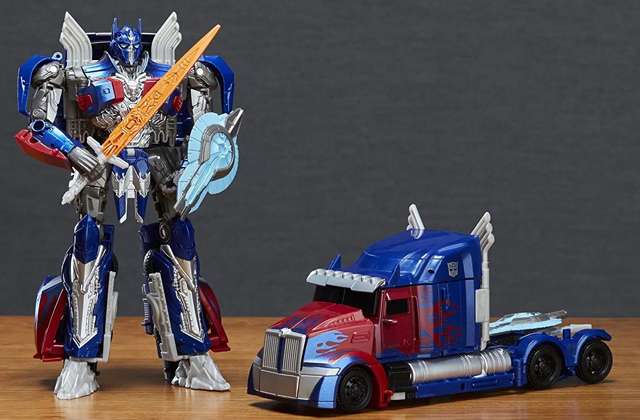 It boasts a translucent sword blade that lights up with distinct authentic humming sound and shines in bright blue. The illumination principle of this model is somewhat different from the others. 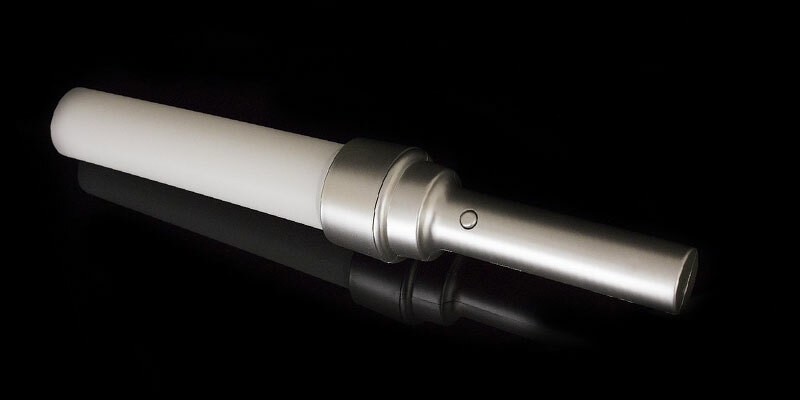 Powerful LEDs that produce a beautiful bright glow change their colour with only a touch of a button on the hilt or automatically with every swing. The colour can alternate even when the lightsabre hits against another object, such as an opponent's weapon. If you want the same colour to remain without alteration, we advise handling the lightsabre gently, swirling and wielding your sword without making fast abrupt movements. Colors alternate in one order: blue to purple and eventually to red and then back again to blue (repeating the circle over and over again). Each colour change, every power on and off, hits and swings, will be accompanied by characteristic humming sound effects. 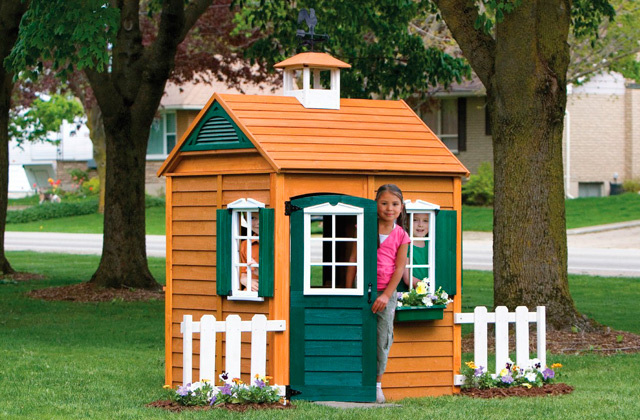 So, you may rest assured that your pretend play or duelling will be both spectacular and colourful. This toy weapon is delivered in a beautiful sturdy original box, which could be used both for safe storage and transportation of the lightsabre. The set of 3 AA batteries comes included in the kit. The power source is already installed into the hilt, therefore there's no need to buy anything more. All you need to do is remove the battery tap and your Galaxy lightsabre is ready for the battle. Swirling, swinging, and wielding are guaranteed to be breathtaking, but beware that the product is not made to last through heavy battles. It may not perform as intended if subject to heavy impact. We believe you will enjoy playing with this novelty toy and hearing the authentic sound effects. Moreover, you will be absolutely impressed by the fidelity of sound coming through the tiny speaker located in the lower part of the hilt. 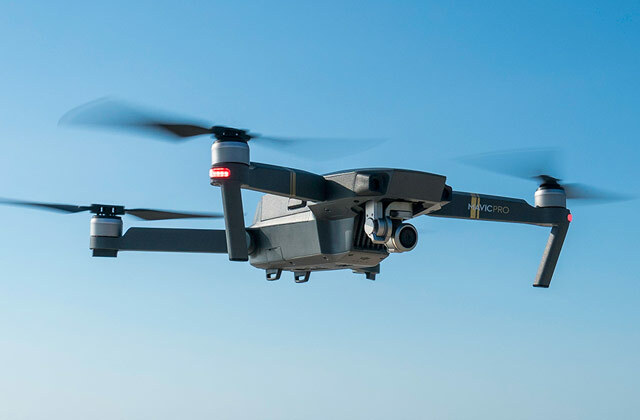 The matter is, it was perfectly camouflaged to blend in with the rubber design and is practically not visible from the outside. If you and your kid are avid Star Wars fans, you’ll fall in love with this Fun Central toy's fantastic design and the authentic sound and light effects it produces. Equipped with a cross-guard of two shorter blades to protect a swordsman's hands from unexpected blows, it reminds a Kylo Ren lightsabre by shape. But unlike a Kylo Ren weapon, this one has blue blades, which means it is a sword of a Jedi worrier. Since 3 AA batteries to power the sword are already included in the package, your little one can start defending the galaxy almost as soon as the box is unpacked. Being 69 cm long, this star wars lightsabre toy is a perfect present for any child or adult fascinated by the saga. By the way, if you are looking for a sword to compliment your Kylo Ren costume, there is also a red lightsabre available. The manufacturer has used safe non-toxic materials and the item is made to last for a good while. Although it is not the sturdiest model and its design may slightly differ from that on the picture, most users admit that it is an excellent value for the price. 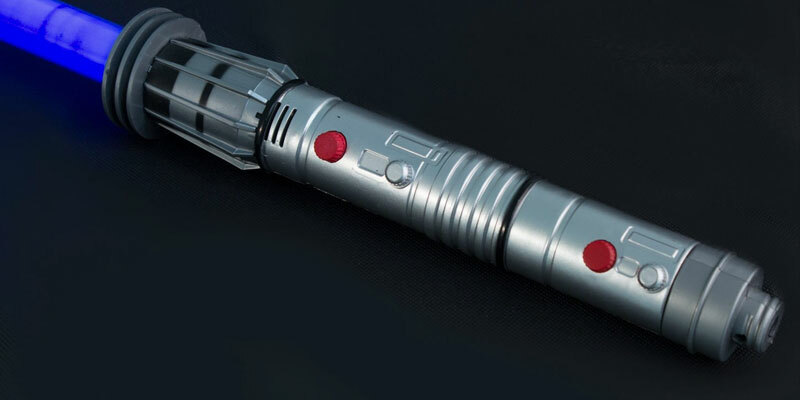 A cool thing about lightsabre toys is that they not only look like those you have seen in the film but also have true to life sound effects, and this cost-effective model is not an exception. When on, it produces a humming sound similar to that of its on-screen prototype, and just like in the film, it will alter as you swing the sword around and hit something with it. Thus, it will give your little ones the feeling of being participants in a story they love so much. Combined with visual effects (the lightsabre looks just amazing, especially in the darkness), it's an extremely realistic toy. 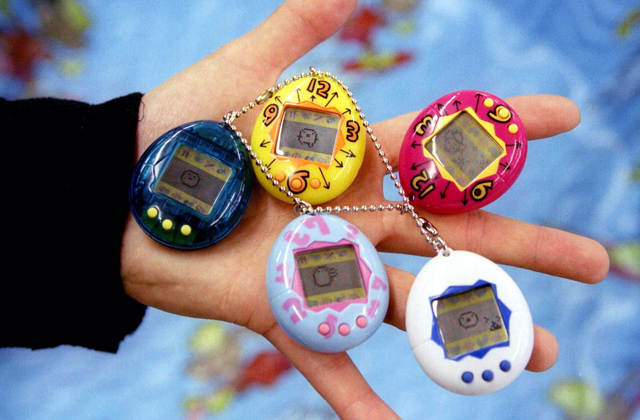 It is not a secret that kids adore playing with toy copies of their favourite animals, vehicles, and on-screen characters; each of these things is an excellent gift idea, just consider your kid’s interests before making a choice. If he or she is a Jurassic Park fan, you are very likely to find a perfect present in our dinosaur toys review. 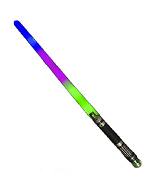 The Glowhouse light up sword is a real find for any galaxy protector. 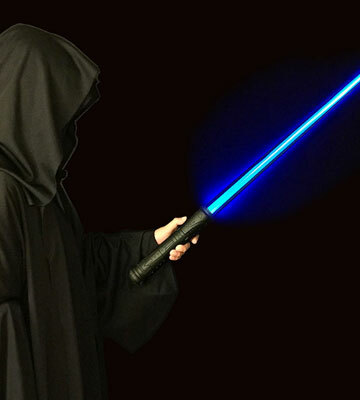 Being only 37 cm long when retracted, it is easy to carry along with you or store away when not used; if it is time to fight, the sword can be extended up to 93 cm long (this is actually one of the longest lightsabres on the market). Next, there are as many as eight colour modes available – just push the button on its hilt to switch on the desired setting. You can choose one of the static light modes if you prefer fighting with a green or blue lightsabre, or switch to a colour morphing option if you want the sword to shine all colours of the rainbow. 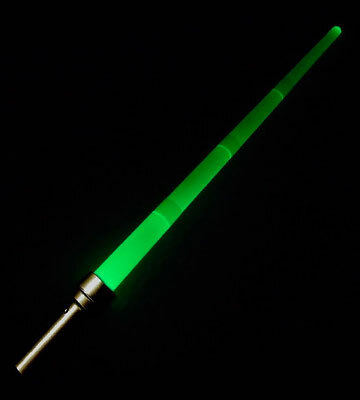 Thanks to this feature, this lightsabre is an ideal choice for avid cosplayers; you can pick an appropriate colour to make your Luke Skywalker, Mace Yoda, Rey, Darth Wader, or any other Jedi or Sith costume look just amazing. It is also an excellent item to give as a present to your little Star Wars fan (it is suitable for 3+ children). Besides, the accessory comes in a gift-friendly packaging. Just keep in mind that the lightsabre was not made for duelling, so try to explain your kids not to hit objects or their counterpart’s sward too hard to prevent the toy from breaking and losing its “magic power”. To ensure durability and excellent performance of the unit, the manufacturer has made it of high-quality materials and equipped it with ultra-bright LEDs. You won’t have to purchase batteries additionally. 3 x LR44 batteries are included in the package, so it’s got everything to let you start playing right out-of-the-box. 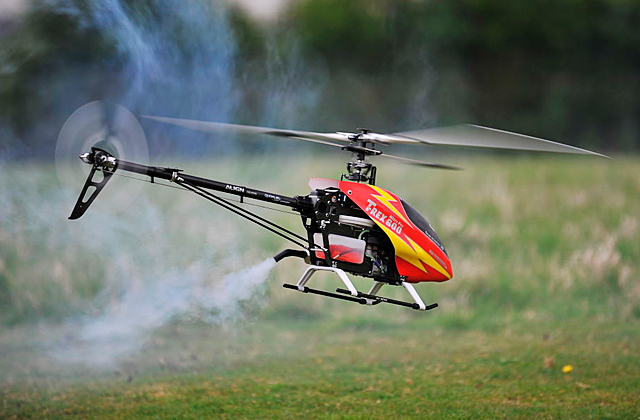 It is pretty user-friendly as well - the sward can be extended in a breeze and the modes are easy to switch. All in all, the Glowhouse light-up sword is an awesome toy created to inspire the saga fans of all ages. While a lightsabre is a wonderful light-up toy to keep your kid entertained during the day, a night lamp is an awesome device that emits soothing light to create a sleep-friendly atmosphere in a children’s room. If you love throwing themed parties or you are looking for a functional and beautiful accessory to give your place a retro touch, consider one of these charming lava lamps. The Glowhouse is a well-known company producing a wide range of glowing and flashing toys and accessories designed to make your every day brighter. However, from a variety of fascinating shining items, it is the lightsabre that every true Star Wars lover will pick first of all. Lightsabres are usually made blue, green, or red so that you could pick the one of the same colour as that of your favourite character's sword. But what should you do if you want to go further and combine the power of several crystals in one weapon? The power of all of the lightsabres that have ever existed is gathered in this fantastic sword! It is fair to assume that the owner of this sword can become the mightiest worrier in the Galaxy. The accessory will perfectly complete your Star Wars costume allowing you to look stunning at any themed party. 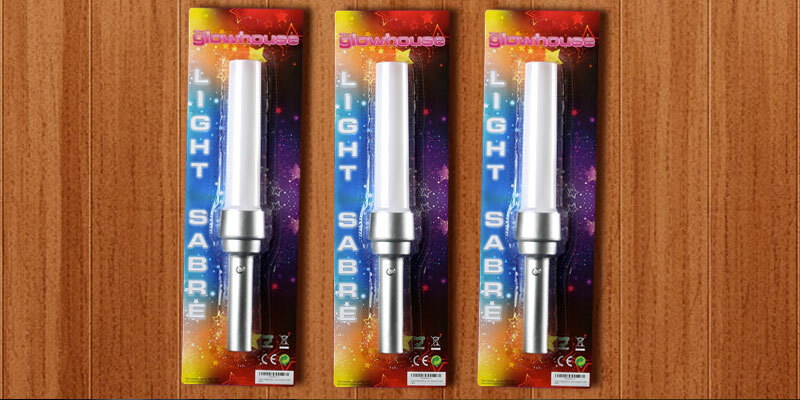 To ensure such an amazing effect, the Glowhouse Light Up Sword is equipped with three bright LEDs that produce three different colours. The blade is green near the hilt, purple in the middle, and blue up to the point of the sword. But that's not the only thing that makes it different. Just look at its pommel - it is an energy crystal that is usually hidden inside of a lightsabre, but not this time, not with the Glowhouse Galaxy sword! Don’t miss a chance to impress your friends with this unusual weapon that shows the beauty and power of the Force in a simple and elegant way. Bet your kids would like to light up the sword as soon as they unpack it! The Galaxy lightsabre is supplied with batteries, so you don’t have to worry about buying them additionally. The unit is made of quality materials, and the LEDs remain cool to the touch during the operation. As you can see, the manufacturer has created the sword that looks fantastic and has a thought-out design. Just keep in mind that practising with this weapon is more about technique and philosophy and it is better to avoid hard blows if you do not want your lightsabre to get broken. It is “an elegant weapon for a more civilized age”, after all. 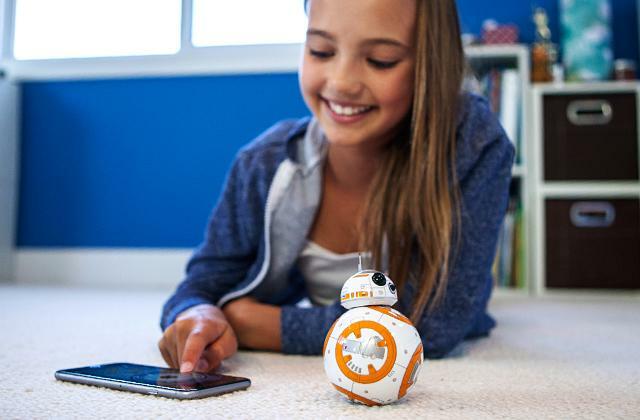 If you want to entertain your kids and let them learn new skills, consider buying a toy robot. 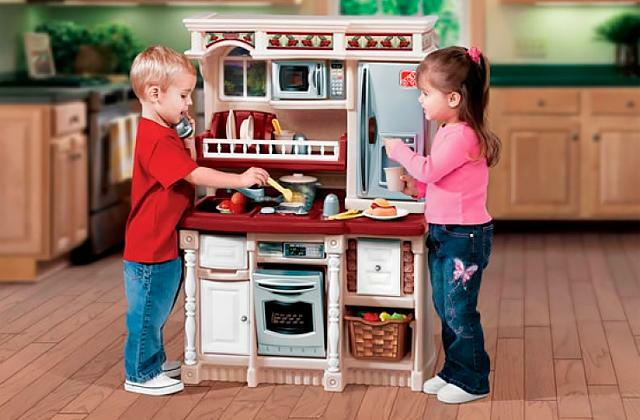 This wonderful interactive toy will keep them amused for hours. 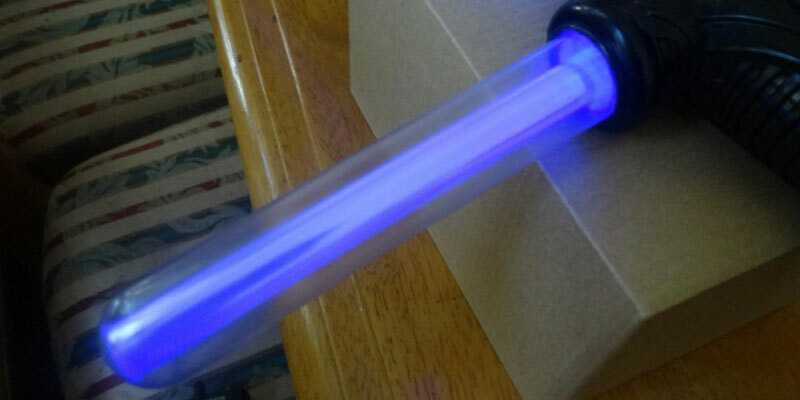 Among a variety of lightsabre toys, those models that combine cool sound effects with awesome glowing light are usually the most attractive for kids of all ages. The Mintoys LED light sabre has both of these features. Just press the button on its handle and you will see the laser blade glowing and hear that humming sound from the film. The top button is for battle-clash sounds and lights; the item is equipped with a motion sensor to make your duelling as enjoyable and exciting as possible. Bright at daylight, the lightsabre looks just amazing when it is dark outside. In addition to realistic light and sound effects, this model has more features to impress true Star Wars fans. 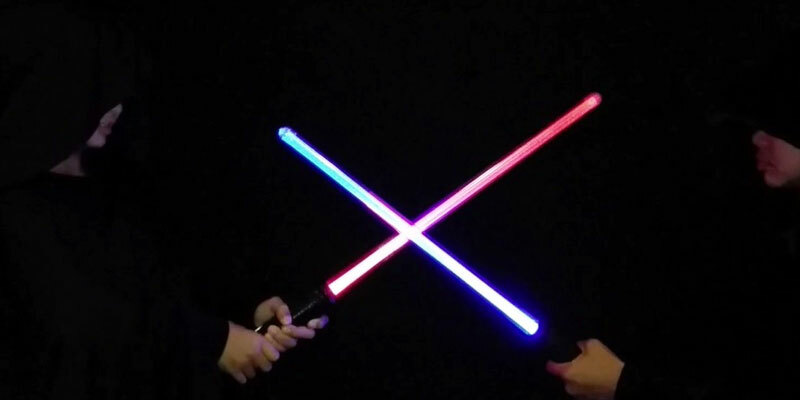 We are talking about a unique design of the unit: two Mintoys swords can be connected to create a double-bladed lightsabre. A handy connector for an easy and quick assembly of the sword is included in the package. 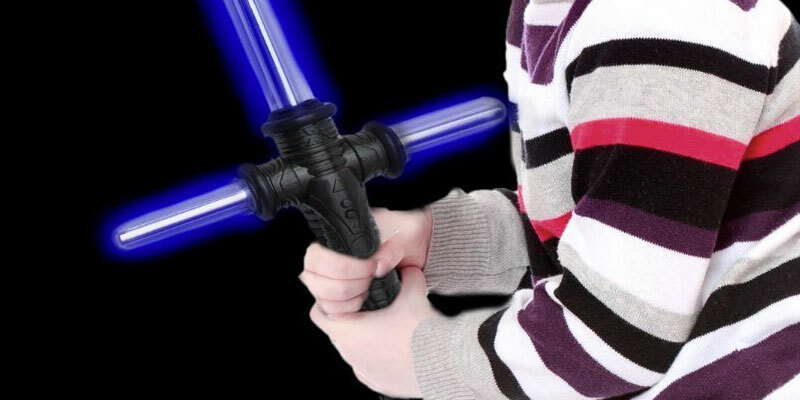 This fantastic lightsabre is recommended for kids of 5 years old and up. Remember that scene from Star Wars Episode I when Darth Maul appears? You might agree that it's not only his un-human appearance that makes him different from any other warrior; the villain is armed with a sword that looks much cooler and is twice as effective as a conventional lightsabre. Who knows, maybe Qui-Gon Jinn would have survived in that battle if he had been armed with this kind of weapon. With this fantastic Mintoys toy, you will be able to practice fighting with both one- and two-bladed options of the sword; as we have already mentioned, you can connect two items to create a weapon as powerful as Darth Maul's lightsabre. 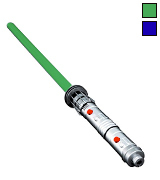 However, this lightsabre is meant for those on the light side of the Forse, so there are green and blue colour options available. 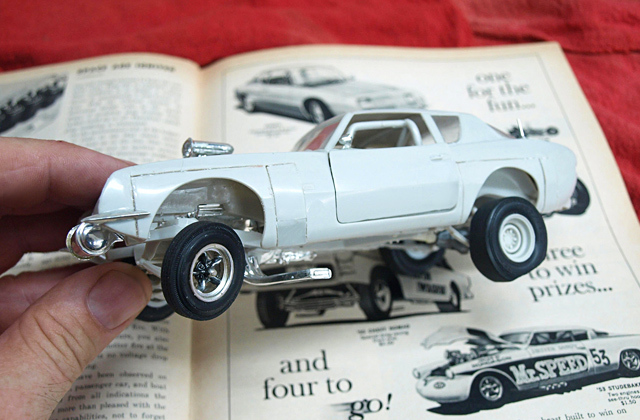 A wonderful way to keep your little ones entertained is by getting them a slot car track. Just like a lightsabre, this toy is also appreciated by adults, so you will have a wonderful time together, practising your racing skills and holding championships. The lightsabre is one of the most popular weapons in the history of filmmaking. It is an energy sword used as a signature weapon of the Jedi warriors and their dark counterparts, the Sith, in the Star Wars universe. The fictional saga has gained so much in popularity and won so many fans that it grew into a gigantic franchise with a multitude of facets and immense cultural impact. It gave rise to a large number of TV series, films, spin-offs, cartoons, comic books, as well as a variety of costumes, toys, weapons, and accessories employed in the Star Wars saga. Anyone can now step into the shoes of both beloved and infamous characters, such as Luke Skywalker or Darth Vader. All the fans from young to old love dressing up in the outfits of their favourite heroes (or villains) and role-play the legendary scenes and battles. Many generations of teenagers tried to master the Force and make it their own with quite a realistic toy weapon, lightsabre! These powerful sabre swords can help any true Star Wars enthusiast discover the presence of the Force within and around as well as blast off into intergalactic adventures! The models presented in our review look so realistic, that they perfectly replicate the authentic lightsabre weapons used by the legendary Star Wars characters. Below you will find 5 best high-quality lightsabres from the most reputable manufacturers carefully selected for you from the variety of models available on the market so that you could easily choose the one that suits you best. If you want to compete with your friends in thrilling breath-taking races, have a look at our reviews of best ride on tractors. 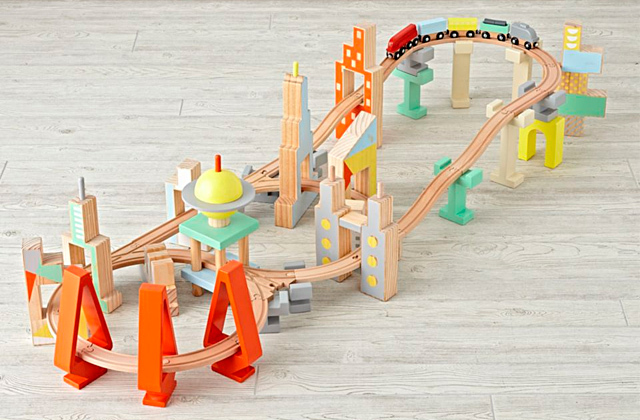 For those looking for developmental toys, we advise considering marble runs and activity cubes. If you recall the canons of the Star Wars Universe, the Sith, who represented the dark side of the Force, and the Jedi knights, employing the power of the light side, both used the lightsabres as their signature weapon. The plasma blade of these energy swords emitted from the metal hilt was powered by kyber crystals. These rare crystals used to grow naturally on different planets throughout the vast spaces of the Galaxy. They were strongly connected to the Force and offered their owners the immense power to cut through practically anything. However, the crystals were highly in tune not only with the Force but also with their owners. Thus, the opponents of different sides of the Force used crystals with different colours. All the Jedi knights possessed the lightsabres powered mainly by either blue or green crystals, but all the supporters of the dark side of the Force could have been recognized by red plasma blades. Thus, like all the Jedi knights before you, make up your mind whether it is the light or the dark side of the Force that you are willing to join! The next thing to consider is the design of the lightsabre. Every model can differ in its own way. You can even configure the toy weapons yourself that will definitely be one of a kind. The blades can be either fixed or removable. Think in advance which model you prefer, as there are both limitations and advantages to each one. The fixed blade is considered to be more durable, but with a removable power blade, it will always be possible to replace it in the event of failure. If you intend to partake in an intense duelling or a heavy battle, you would be much better off purchasing the weapon with a removable blade or made out of durable polycarbonate material (rather than delicate and feeble plastic). Beware, that some blades can be easily damaged when they come into strong contact with other swords. 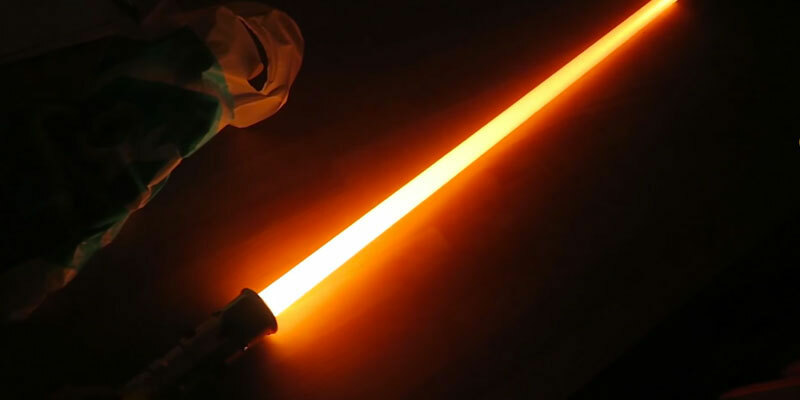 Undoubtedly, it is the material that plays a major role in both the appearance and durability of the lightsabre. Cheaper and less sophisticated models are made of plastic, and will not be able to last through intense battles with rough boys. In more expensive models, the hilts are made of metal, and the blades themselves are made of sturdy and durable polycarbonate. Therefore, those of you who want to stage realistic role-play fights should rather invest a little more in the latter costlier option. The length of the sword also plays a significant role, as it will affect how authentic it feels in your hands. 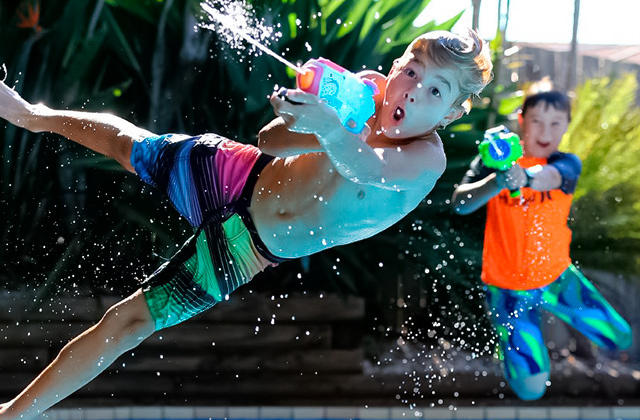 Younger Star Wars enthusiasts would be more comfortable swinging a shorter weapon, while grown-ups would be better off wielding a more realistic one. 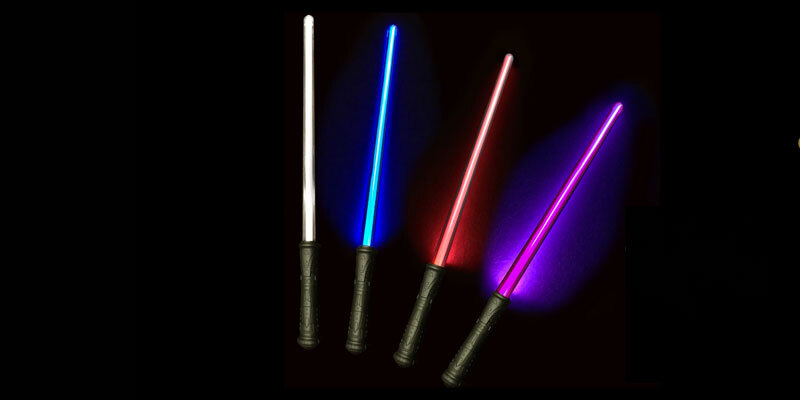 Most lightsabres offer movie-accurate light and sound effects. The better the quality of the lightsabre's visual and acoustic effects the more spectacular and realistic your battles will be. With regard to visualization and sound, fans highly valued models with the original on/off humming sounds from the movie. The characteristic sounds and lights of every swing and clashes will also add realism to any fight. In some cases, the lightsabre kits contain additional elements. For instance, they may include display or storage stands, which can allow you to safely store the lightsabre in-between the intergalactic battles. All of the lightsabres can be powered by either chargeable or rechargeable batteries. Therefore, we advise you to have a look in advance at what kind of batteries are needed to power your toy weapon and whether they are included in the kit. In any case, we believe a set of rechargeable batteries with a charger would be a very wise investment. Keep your energy weapon fully powered at all times and "May the Force be with You"! If you were making a film of a story that happened "a long time ago in a galaxy far away", and this film was about knights and villains, good and evil, love and hate, what kind of weapon would be in your characters hands? Making Star Wars saga, George Lucas was also looking for a weapon appropriate for the peacekeepers of the galaxy. It was supposed to be a sword, but not the one with a steel blade. They were looking for a special weapon that would have a futuristic look. After all, the story takes place in a world where space travels are as common as airplane journeys. With the invention of the laser, the idea was in the air, so a lightsabre (or a laser sword as it was called in the first draft) was just meant to be in the film. It took time and effort before the creators managed to make the "elegant weapon" look and sound which would make people believe that it was a part of the Force itself. But it was worth trying, and today there is hardly someone unfamiliar with this fantastic laser weapon and that humming and buzzing sound you can hear during the battles. Why Are There Green, Blue, and Red Lightsabres? For the film characters, creating a lightsabre was not an easy task as well. To make such a sword, the Force-users needed a crystal(s) to produce the sword blade; to imbue it with the Force, Padawans needed to obtain a mental state of tranquillity and meditate on that crystal for days. But before that, they went to the planet of Ilum to gather the cyber crystal, one of the thousands that would call for them and put it into a lightsabre. What is interesting, according to the legend, the crystal remains colourless until it is used by a certain warrior for his sword. 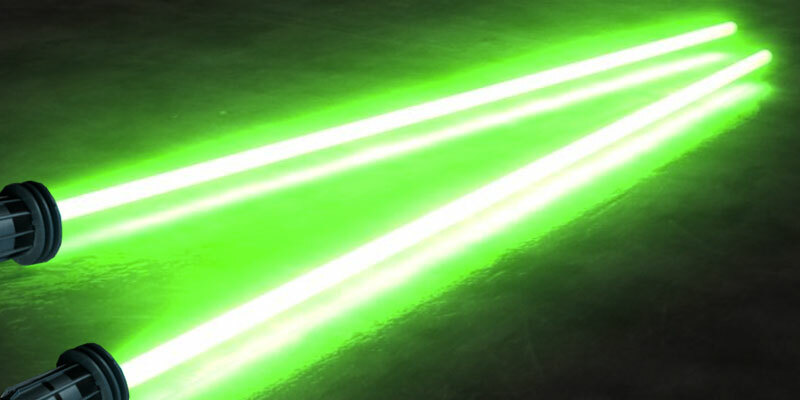 Jedis' laser swords usually have either blue or green blades (for example, Yoda lightsabre is green, Anakin lightsabre is blue) and are mostly used for defense. However, in the evil hands, a laser sword turns into a dangerous weapon. Forced to serve anyone who is on the dark side, the crystal turns red, as if it is bleeding. That is why Darth Vader lightsabre and other swords possessed by villains have blades of a red colour. The design of a lightsabre and a blade may vary as well; it is sometimes modified and enhanced (Darth Maul lightsabre is double-bladed, Kylo Ren lightsabre has a crossguard), and for some reason, it's usually done by villains. These laser swords are even more difficult to make, for example, Maul used as many as four crystals, free from impurities, for his weapon. This required all concentration, all power of the mighty warrior. In any case, the deadly weapon of Sith didn't always bring them victory. Q: How safe is this toy? A: We can assure you that regardless which model you choose, all the toy swords presented in our review are made with the strictest adherence to safety standards and are really safe for play by the youngest warriors. They all have smooth surfaces without any sharp edges. However, there are several factors you should take into consideration when buying this toy weapon. Firstly, do follow the manufacturer’s age recommendations. 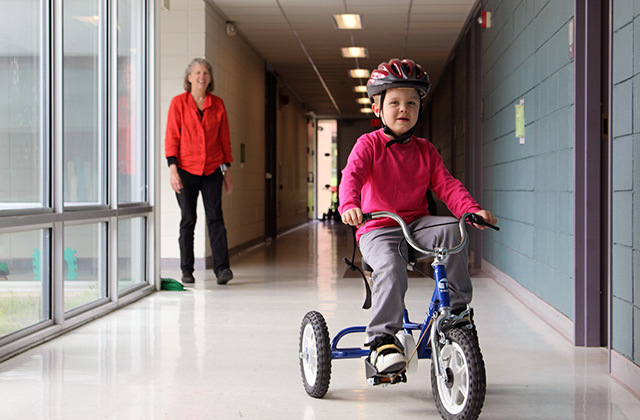 3- to 6-year old kids generally love experimenting with new things but their physical skills are still emerging. It would be hard for them to handle heavy and large swords. So, make sure to check the weight of a toy lightsabre and its dimensions! The length varies immensely across various models; there are really small-sized lightsabres that would be ideal for young Jedi younglings! Besides, the lightsabres made entirely of plastic are likely to be more lightweight and easier to manoeuvre. 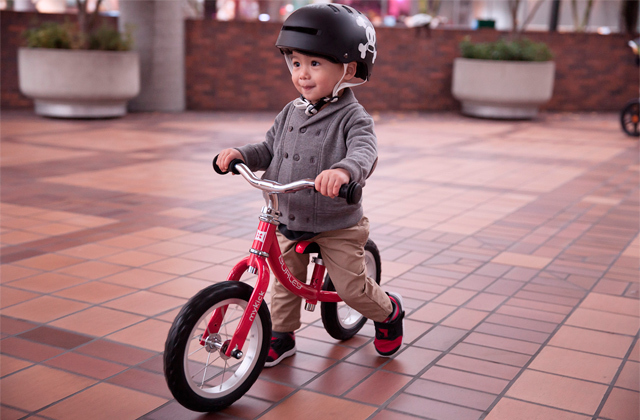 Just keep an eye on your toddler so that he/she does not accidentally knock off any fragile objects in the room. Q: Do lightsabres have any special film-like effects? A: Most lightsabres (especially the ones you can find in our review) offer spectacular and truly authentic both visual and sound effects. Speaking of the visual effects, they would certainly depend on the model you choose. They may include impressive colour transitions. For instance, the blue blade can slowly pulse and crackle to red, thus symbolizing the struggle of Anakin’s fall to the dark side. As you ignite the lightsabre, the blade would slowly power up from bottom of the hilt to the very top like in the saga! Some toys boast amazing battle-clash lights that make the blade glow brighter every time you hit the opponent’s weapon as if sending sparks flying in the air. The sound effects of any lightsabre always have power on and off sounds. Some models equipped with a motion-controlled sensor will allow you to hear your every swing, while other lightsabres will let you feel the presence of the Dark Force with the sound of Darth Vader’s breathing. Q: Can I replace the blade in my lightsabre if it is broken? A: It depends. There are models with either removable or fixed blade. 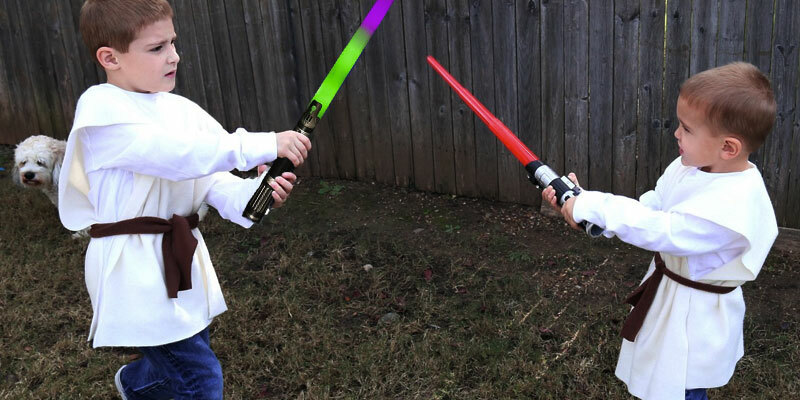 So, if your kid wants to take part in role-play battles, we advise either battle with caution or get him/her a lightsabre with a removable blade. Should anything happen to the blade during intense duelling, you will always be able to replace it with minimum cost and effort. Q: Can I hit other swords with a lightsabre? A: Generally speaking, most lightsabre models are not meant for hard play, intense duelling, or heavy contact. Even if the blade survives your hits, LEDs inside it can be easily damaged and leave dark “dead” spots on your toy. Q: Do I need to buy any additional batteries to make a new lightsabre work? A: Not necessarily. Some models come with the batteries already included in the set. They are ready for use and you can get them started right out-of-the-box. For others, however, you need to purchase the batteries additionally. Hence, it is better to clarify this information before purchasing. Note that many customers complain that their lightsabres simply eat the batteries and under intense use, the toys quickly run out of charge. So, we believe that keeping a spare pack of batteries is a good idea. Q: Can I turn the power on and sounds off? A: Normally, lightsabres do not have a separate function to turn the sound effects on or off, as the sound works together and in sync with the light for more spectacular battles. All you can do is to power your sword off and enjoy noiseless swinging. 1. How to Choose a Lightsaber, wikiHow. 5. Kati Bartlett Ever Wonder Why Lightsabers Have Different Colors? Here's the Meaning Behind it!, Movie Pilot. April 5, 2016. 6. Your Guide to Buying Lightsabers, eBay. March 10, 2016. 8. Star Wars expanded universe, Wikipedia.